This is a common condition which causes the thin, clear layer of tissue that covers the eye, the conjunctiva, to swell. The eyes will be red, bloodshot and watery, they will also feel gritty and itchy. Infectious conjunctivitis will also produce a pus that will make the eyelashes sticky and crusty. You may also feel sensitivity towards light. *Children are in close contact with other children at school and play who may have conjunctivitis. *Older people as their immune system may be less able to fight infection. *People who have recently had a cold or virus and again may have a reduced immune system. It can also be caused by an allergic reaction for example, to pollen or dust mites. This type is not infectious. You can remove crusts on the eyelashes by washing with warm water on a cotton pad. Place a cool compress on the eyes to help soothe any burning sensation. It is important for infectious conjunctivitis that you wash your hands regularly and do not share towels or pillows to prevent spreading the condition to others. The condition will usually clear up on its own, however, more stubborn cases will be prescribed antibiotic eye drops. Allergic conjunctivitis will benefit from antihistamine eye drops depending on the source of the allergy. If you are a contact lens wearer, you should stop wearing your contact lenses until the condition clears up. You should also discard the contact lenses you wore before the infection as they will be contaminated and will cause the infection to re-occur. 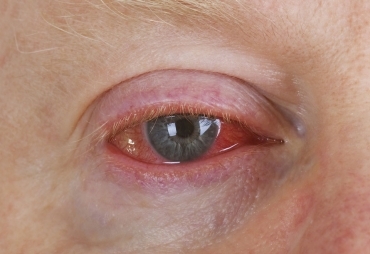 So, if you are experiencing red, bloodshot and watery eyes which may also be feeling gritty and itchy it is advisable that you get them checked by an optometrist to determine if you have conjunctivitis. You can contact us for an appointment if you have any of the above symptoms.